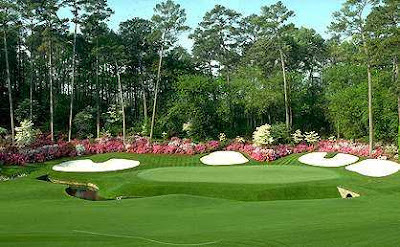 #1: Masters=a huge Southern tradition. 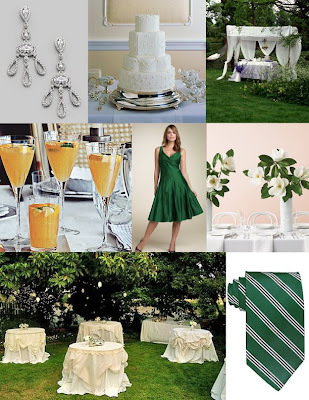 Things like draped white tablecloths, mint juleps, and champagne punch are all "must haves". Oh, and don't forget the monogram. The joke is that in the South, after asking your name, more often than not you're asked for your Mother's maiden name as a way to find out your family line. Some find this backwards, others just tradition, but either way a classic white on white monogram will always be found. #2 A Masters wedding is a preppy wedding. Seersucker and khaki will most likely always find their way into the scene as will a lot of magnolias. These huge beautiful trees line most of the oldest streets of Augusta, but more importantly they line the main entrance into the course. Other important flowers to use (or have growing if this is in someone's backyard) are azaleas and dogwoods. Augusta is known as the Garden City, and these shrubs and trees explode into beautiful whites, pinks and red right around the Masters. #3 The colors. This is probably the most important part. There are certain colors associated with the Masters- most notably the coveted green jacket. It's a very particular green (no lime here!) but since it is so hard to match, the closest green to use would be the color of magnolia leaves. Kind of a lush, dark green. For the other colors that can be incorporated just look to the logo (the U.S. is a warm yellow, Augusta is marked with a red flag, and Masters is written in white). Any way... I hope y'all have fun looking at this one (as well as got a good laugh at how seriously Augustans take this tournament :) ) Have a great day everyone! !